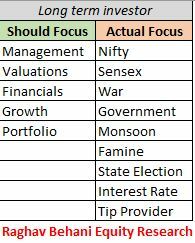 NIFTY View Nifty PE above 25: What next? Nifty PE above 25: What next? There is no second thought on the fact that the markets are at a heated up valuation. A lot of clients who want to come aboard join us are concerned that this may not be the right time to enter the markets as the markets are “heated up”. In this post, we do a careful analysis of where the markets are currently and what do we make of it from a long term investors perspective. To start off, we look at some common valuation indicators like PE ratio, earnings growth rate, interest rates, dividend yield and VIX. Nifty’s PE has stretched to 28 twice in the past and close to 26 back in 2011. We are still lower than the past PE peaks which means that there is still room for further PE expansion, maybe Nifty even creates a all time high PE! We cannot predict the peak. Every time the Nifty approaches high PE levels, there is euphoria in the markets with investors and fund managers claiming – This time it is different. However, markets cannot outrun fundamentals forever. Reality has to catch up. So what exactly is the reality? After almost 2 years of growth rate trending lower, we are seeing the earnings growth catching up with the stated GDP growth. As we maintain, if GDP is to grow by 8% p.a and inflation is 6% p.a. then the Nifty EPS has to grow by atleast 14% p.a. Currently, the growth rate is trending at ~ 9% p.a. with analysts expecting a 18% to 20% growth in earnings to kick in by Q3FY18. At a firm level, we expect FY18 earnings growth to be in the 8% p.a to 10% p.a. range. 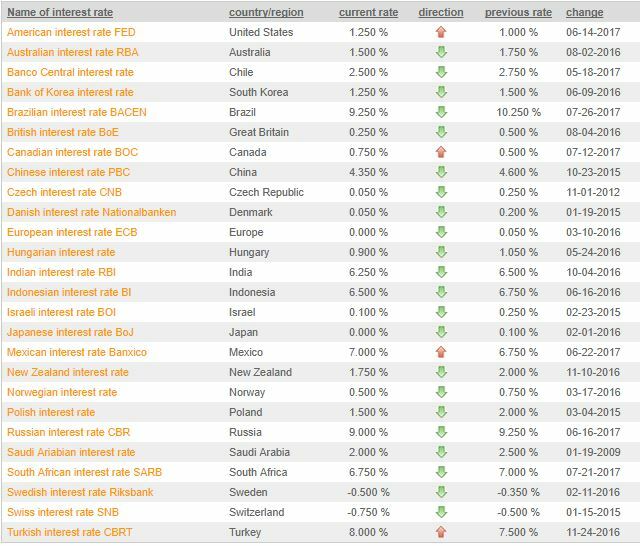 A casual look at the monetary stance of central banks around the world shows that interest rates are trending lower. While the cycle is approaching a bottom we don’t expect it to climb up sharply. The low rates will sustain as of now. A low interest rate environment makes equities a favourable investment option as fixed income instruments see lower yields and also earnings expand due to lower interest costs and faster expansion. Nifty has delivered negative 30% returns in one year when the PE level is above 24 and a meagre 5% p.a. 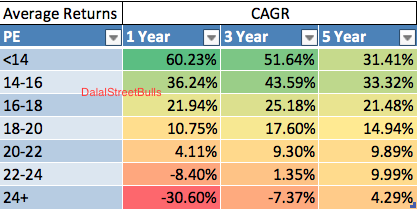 CAGR over 5 years following the high PE zones. So at current valuations, you should only enter the markets with a long term view. The above returns only give a broader market perspective. Our aim as an investor should be to outperform this number. As a firm policy, we give immense importance to dividends. A track record of regular dividends coupled with a high dividend yield will help you to outperform the market and also acts as a cushion during tough times in the market. We track the Nifty dividend yield as a measure of the safety net out there. Nifty’s dividend yield is at 1% while the long term average is around 1.5%. This signals a very low margin of safety out there. Coupled with a high PE environment, a low dividend yield signals that investors are paying a huge premium with little margin of safety available. And with this assumption, the expected volatility is trending lower and lower. India Vix is at historical lows. Vix is a measure of expected volatility and usually, higher the Vix, lower the market is expected to go. Investor confidence is very high as a low vix indicates higher confidence. The above table is really philosophical in terms of Half full and Half empty. While the 2000 to 2008 period saw a 17.28% p.a. CAGR between both the market peaks, the 2008 to 2017 has seen a meagre 4.97% p.a.